Forget chopping and sticky fingers—our Fuji apple slices are all fun and games. 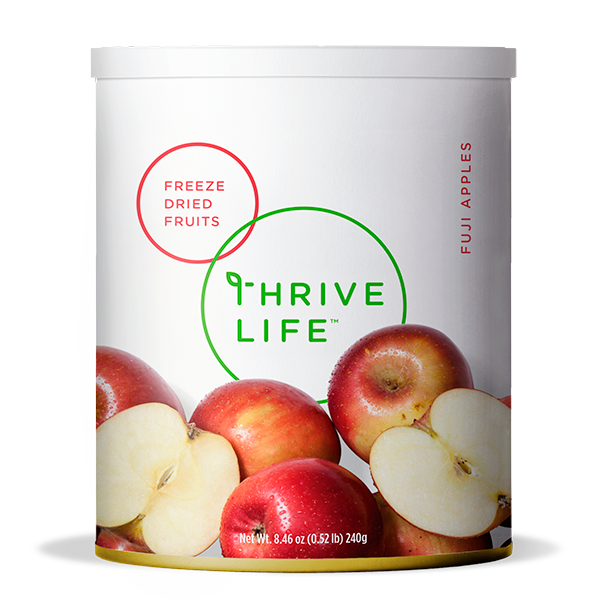 With Fuji's signature sweetness, Thrive Fuji apples are ready to rumble as an on-the-go snack. We also slice our Fuji apples with the skin on, so they're ideal for salads and caramel dip. Go ahead. Eat an apple a day (...or three, or four). It’s never been so convenient. APPLES (TREATED WITH ASCORBIC ACID, CITRIC ACID & SODIUM CHLORIDE). Add 1/2 cup water to 1 cup Fuji Apples; cover and let sit 5-10 minutes or until tender. These slices have a sweeter taste than our Granny Smith Apples, and still have the skin on, so they’re perfect for fruit salads and other recipes that call for unpeeled apples. They make great snacks right out of the can and no sticky fingers. They’re the perfect size for dipping in caramel or yogurt.